Pennsylvania Owes William Penn Money! Dateline: Philadelphia, 7 April 1690. William Penn writes to the Council laying out how to pay him back for the £600 (huge!) he spent out of his pocket to keep Pennsylvania going. Be sure to look at the highlights at the end, if you want the basics. The Proprietary (proprietor) is William Penn, who is in England now. 2nd Whereas there have been several acts made and impositions [taxes] laid upon exported and imported [goods] under pretense to raise money for the Proprietary, towards support of his government, whereby many who are very willing to support the necessary charge thereof are possessed that the Proprietary has great sums of money given him for the defraying the same, which mistake has, I fear, will be more prejudicial, not only to the Proprietary, but to his whole government, for I humbly conceive this board is sensible [aware] that it has not only not brought in one farthing, but encouraged him still further to launch out his estate in expectation of it, to the use of the public; and not only that, but in the opinion of your humble remembrances, like to drive the trade from this province unto our neighboring colony, which if done will be difficult to recover. Or stock the three plantations of my three children, each 200£ comes to the sum, I shall take it well; and this may be sooner and safer done than returning me that sum, though here it would have done me more good. 5.. I further humbly offer to your consideration what the Proprietary was pleased to write to me, in his letter bearing date the 13 2nd Mo., 1689 [13 Apr 1689], viz: I send to seat my children’s plantation that I gave them near Pennsberry by Edward Blackfan [sic]. Either let them settle me on three plantations for my three children 200£, each, which make up the 600£; or lay it out in a city house for me, that I may be encouraged to live among them, though it would now do me more good here. Lastly, the sum expected aforesaid as a debt due the Proprietary and ought immediately to be paid is a certain sum, viz, 600£, which cannot be raised but [by] a tax or some other course as may be certain in some short time to amount [add up] unto the full sum, clear of all charges and not by importations or on navigations, which are uncertain. 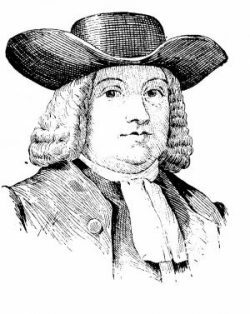 The Province of Pennsylvania owed William Penn, 600£, which he paid out to help the fledgling province. His expenses have been “great and almost incredible” [unbelievable]. The small government promised to impose taxes on imported and exported goods, but this has not been done—not even one farthing. The people of the province wrongly believed that he had limitless funds. And this mistake has led them to be careless. An alternative way to pay him back is to build him a house in the city on his own lot, and to settle him on three plantations that he gives his three children, valued at 200£, each. That is a worse way, but he is willing to go for it. A tax is a certain path to repay him, while shipping is not. William Penn’s “Philadelphia’s lot was between Second and Third, High and Chestnut streets. The house built for the proprietor in 1682 has not survived. A cottage built about twenty years later on this site, the so-called Laetitia Cottage, still stands; it was moved to Fairmont Park in 1883.” Laetitia was one of his daughters. Source: William Penn and the Founding of Pennsylvania, 1680-1684: A Documentary History, ed. Jean R. Sunderland (U Pennsylvania P, 1983), pp. 391-92, footnotes 3 and 4. Minutes of the Provincial Council, vol. 1, 1683-1700, (Jo. Severns and Co. 1852), pp. 327-28. This entry was posted in Pennsylvania History and tagged Who was William Penn?, William Penn in colonial Philadelphia, William Penn was owed money by james malcolm. Bookmark the permalink. Curious…did he ever get paid, really? The later records say they built for him a big house, and gave property to his sons. Well good for him !